To kick off my wedding posts, I’m sharing with you how I made the small tokens of appreciation I gave those wonderful girls I called my bridesmaids before our first big dress shopping trip. Bridesmaids do a lot for their brides. They should be thanked. 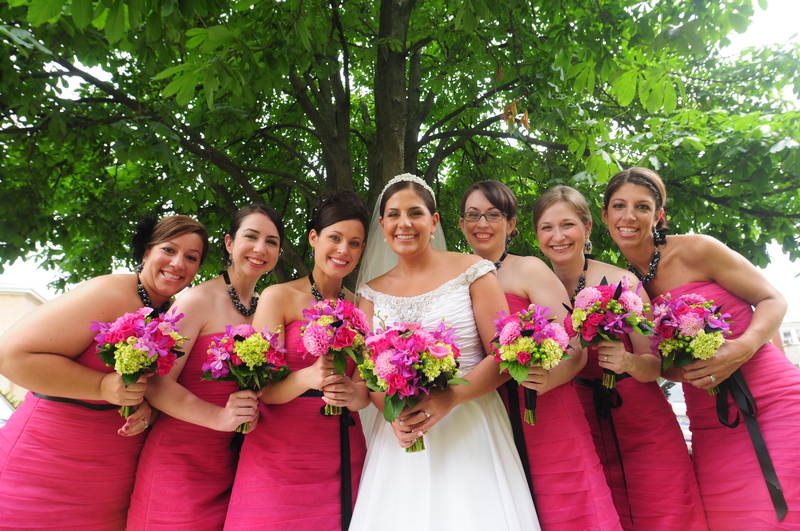 I was lucky enough to have 6 fantastic bridesmaids with me on my big day. I’m even luckier to have them in my life. They are all busy women. Two have small children. All have some form of a higher educational degree. Even though growing up, none of them lived more than 10 minutes from me, getting together now can be a challenge. So when I arranged a date for us to go bridesmaid dress hunting, I was thrilled that 4 bridesmaids could be there. This outing would be the first wedding-related event that my bridesmaids and I would be doing together, so I thought a small gesture to thank them for all they were doing for me was in order. 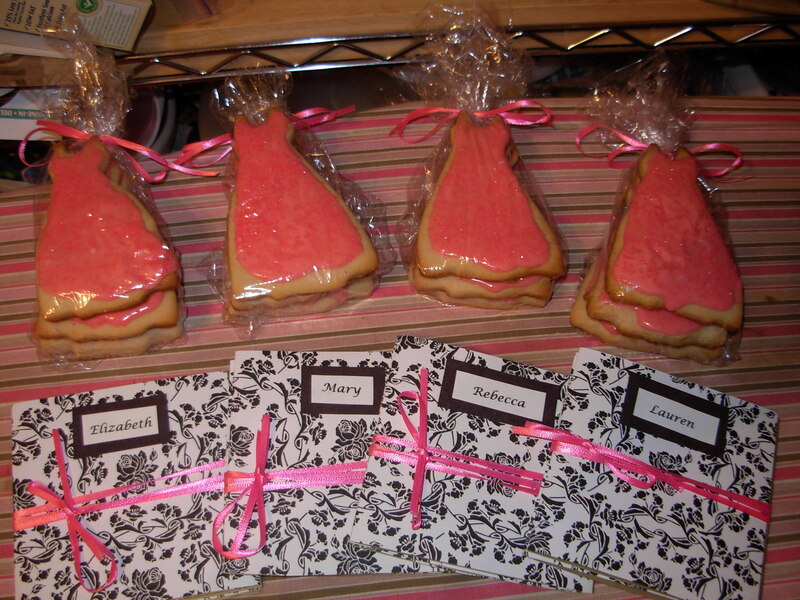 I decided making them a mini memory book and dress-shaped cookies was the way to go. Here’s how I made the books. I started with 3 pieces of double-sided scrapbook paper. I cut each piece into 3 even strips, each strip being 4″ tall and 12″ long. Using clear tape, I taped two paper strips together, making one long strip that is 2 feet long. I did that 4 times. you should have one 4″ strip left over. I folded each long strip of paper into 6 even folds, which is a fold every 4 inches. Your strip should now look like an accordian. Now came the fun part. 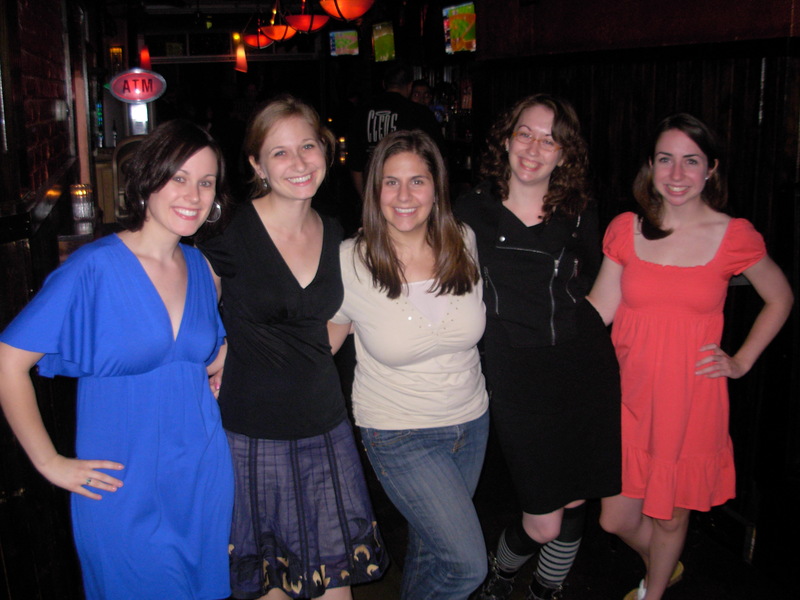 I searched my archives for the funniest and oldest photos I had of me and each of my bridesmaids. Considering I’ve been friends with these girls since we were young’ns, I had quite a few good ones. I started with the oldest photos and worked my way to the present day. For added contrast, I had the pictures printed in black and white. 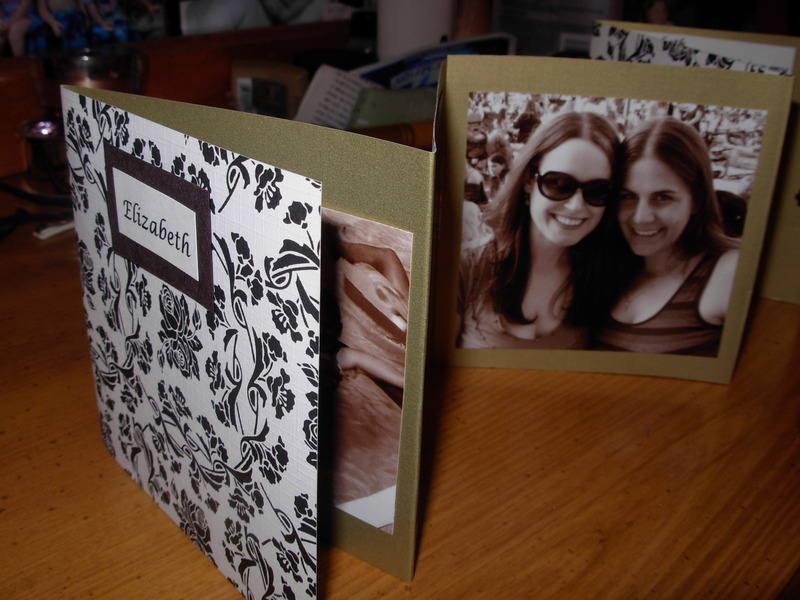 I used 5 photos for each mini book, and on the last open panel, I wrote each bridesmaid a small note of thanks. 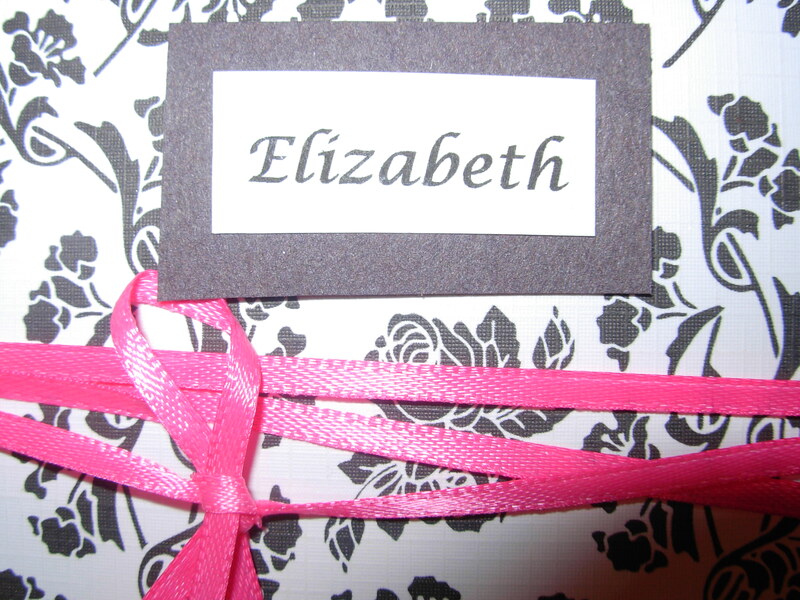 To keep the books together, I bought the thinnest ribbon I could find in hot pink, since I knew the dress we were searching for would be that color. Using a hole punch, punch two holes close together on the front cover of the book. Loop the ribbon in the holes, then wrap the ribbon around the books 3 times. Cut the ribbon and tie a bow. I printed out each name and added it to the front of the mini book as the final touch. Now on to the edible part – the cookies! Use your favorite sugar cookie recipe (or ready to make sugar cookie dough if you’re in a time crunch) and roll out the dough. Take a cookie cutter and cut out a dress-shaped piece of dough. 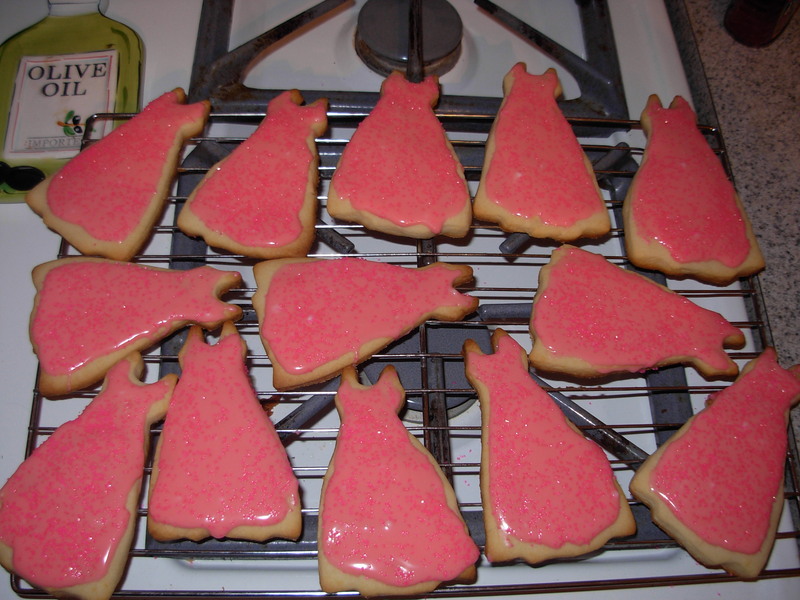 I used this dress cookie cutter. Bake them according to the directions. When they’re done, take them out of the oven and let the cookies cool completely. Mix the powdered sugar and vanilla together until thoroughly combined. Next, add corn syrup and the vanilla until the mixture is smooth. Add in the gel food coloring until you get the color you want. Ice the cookies quickly, as this frosting is made to harden. Quickly sprinkle, if desired. Leave the cookies alone until the icing hardens. Once the icing is dry, the cookies can be stacked. Note: Do not make this frosting until the cookies are ready to be iced. If you make it too early, the icing with harden and will become unspreadable. I gave the bridesmaids the books and cookies after we got back from dress shopping, but before we headed out for a night on the town together. I never got to see these. So cute!!!! !